Just thought I would share the latest addition to the newly renovated office area here. This unit has very clean lines and everything is self contained into one unit. 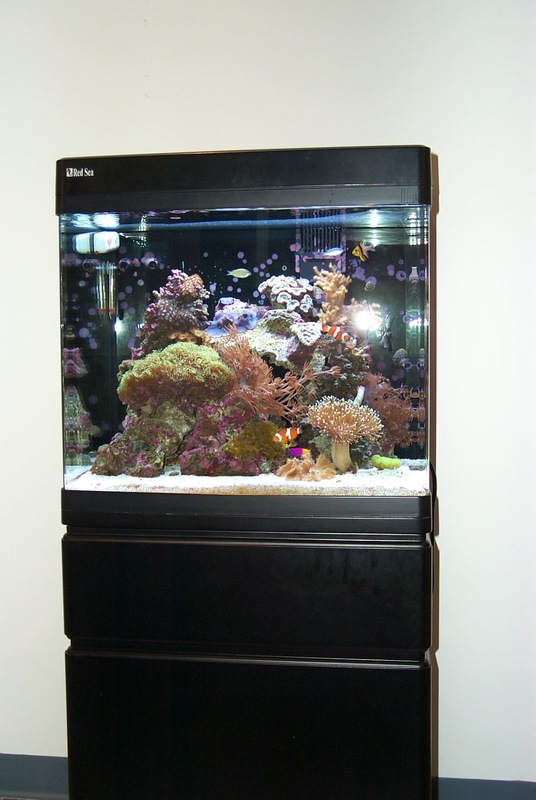 Has 2 powerheads, heater, protein skimmer, carbon, filter media, timer, 2 x 55W 10k + actinics, moonlights, power bar. Just one plug into the wall (afterthought was a separate cooling fan so that makes 2). So far, I am very impressed with the look of it. Seems to be fully accessable from a maintenance point of view. 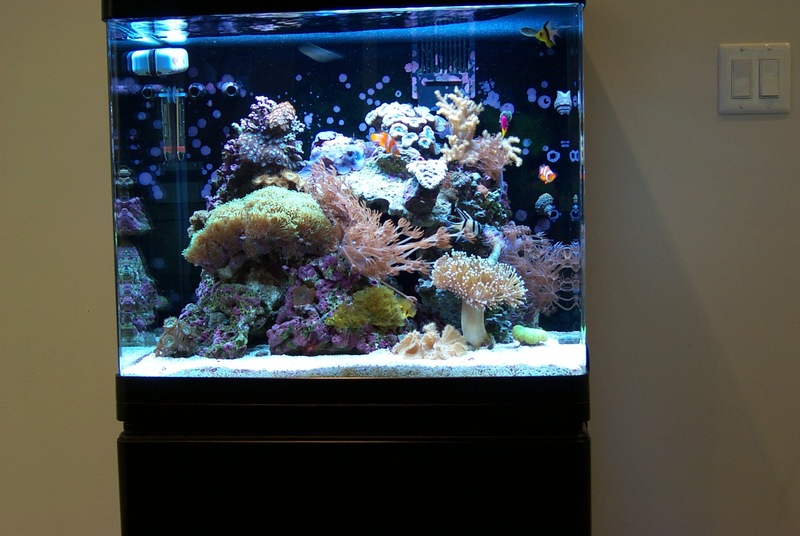 Tank has a capacity of 34 gallons, 29 is viewable. Set this up on the weekend with live sand, fully cured live rock, 25 gallons of water from an existing system, 14 gallons new. Added a clean up crew and corals from an existing setup. It is roughly 24" long x 19" wide x 20" deep. Going to add some fish in maybe a week's time. I am not expecting a cycle, but will keep a close eye on it for this week. Any of you out there with tanks in this size range, what kind of fish would you suggest? Have to get a pair of clowns for sure, but after that? Thanks to Aqua Valley for the goods. cool pics! but very tiny. You should be able to upload jpg's of larger sizes instead. ya.. links are reserved for member with more posts. looks like you're off to an awesome start and i love the clean look of the tank. for what fish to add, maybe a blenny or goby but you're going to have to decide what direction you want the tank to take. keep testing and let us know how the tank matures. Not sure what you mean by direction to take. Just supposed to be a small reef tank with softies, inverts and a few fish. So far the direction seems to be "We should have gotten a bigger one!!" I like the clean lines on the tank and stand... remember... large tanks = more money. You'll have fun with a tank this size... best advice would be to take your time.... I would feed the tank once a week for a month before adding anything. After a month... I would add a pair of clowns and a small cleanup crew(10 blue leg hermits and 10 trochus snails). thats exactly what i meant, so you want reef with corals and inverts, now we can cross out a number of fish. :b15: IJO's advice is the best, take your time, add the clowns when the tank is ready and do lots of research and ask questions while you wait. Just thought I would show everyone the progress on the little tank at work. It has been running just over 6 months now. It probably has more stuff per square inch than my tanks at home. It sure catches everyones attention when they come into the building, they don't seem to mind waiting to see someone. It sure has provided much entertainment to everyone up front as well. Some of the corals are: Green star polyps, yellow polyps, brown polyps, several different zoo's, colt coral, umbrella leather, cup coral, zenia, cabbage leather, hydnophora, blue mushrooms, red mushrooms, candycane, aussie brain. Fish and inverts: 2 ocellaris clowns, pyjama cardinal, banner cardinal, 2 green chromis, royal dottyback (nasty fish! ), blood shrimp, peppermint shrimp, coco worm, porcelain crab, red emerald crab, blue legged hermits, red legged hermits, trochea snails, mexican turbo snails, astrea snails, sand sifting star, and maybe some things I have forgotten about. And of course the pictures are lousy, you just have to see tank in person to get the real picture. Congrats on the nice work ! looks like things are growing nicely in there.